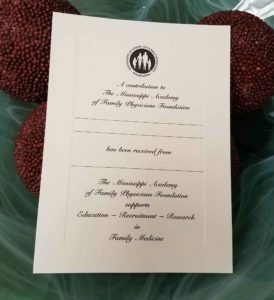 The MAFP Foundation highlights the importance of Family Medicine in the state of Mississippi by promoting a better understanding of what Family Medicine is and what it does. In addition, the Foundation utilizes its’ resources to cultivate current and future physician leaders in our state by providing financial support and scholarship opportunities to high school students, college students, medical students and residents. Please type in the amount or percent you would like to donate. For more information, contact kristen@msafp.org. The MAFP Foundation has available memorial cards appropriate for remembering patients and colleagues who are deceased. A package of ten handsomely-inscribed memorial cards is available with a Foundation contribution of $100. Purchase a pack today.